The US National Conference shall elect an ordained minister to serve as US bishop for a four-year term. This person must have served as a United Brethren elder for at least six years. The bishop shall reside in the area of Huntington, Indiana. The Executive Leadership Team shall appoint a nominating committee and approve the ballot for submission to the US National Conference. b. The nominating committee shall confer with persons they desire to nominate to determine if there are circumstances which would prevent them from serving, if elected. c. The nominating committee shall notify the membership of the US National Conference of its nominations at least 60 days prior to the US National Conference. The nominating committee report may be amended by addition from the floor of the US National Conference if there is only one name on the ballot. The election shall be conducted immediately after the report is adopted. Persons elected must receive a majority of the votes cast by ballot. a. Preside at meetings of the US National Conference. b. Oversee the work of the directors, the staff, and the national leadership teams. c. Ensure that accountability procedures are established for all directors, leadership teams, cluster leaders, and staff of the US national church. d. Create any leadership teams, beyond those specified in the Discipline, needed to better serve the churches and ministries of the US National Conference. e. Maintain a manual stating job descriptions and operating procedures of the national office, staff, and leadership teams. f. Fill vacancies on leadership teams. a. Develop and implement a strategy for recruiting future pastors and churches. b. Station senior pastors in conjunction with others assigned to that task. d. Ensure that local churches are assigned to a cluster relationship. e. Conduct ordination services or assign this responsibility to another ordained minister. a. Interpret the Discipline. The bishop’s ruling shall stand until the next meeting of the US National Conference or of the Executive Leadership Team. b. Develop and communicate the vision of the church in cooperation with the Executive Leadership Team. 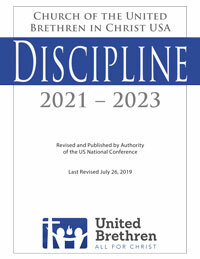 c. Promote and communicate the Core Values of the Church of the United Brethren in Christ, International, and the Discipline of the Church of the United Brethren in Christ, USA. a. Ensure that US National Conference entities comply with any joint ministry agreements with any other United Brethren national conferences. b. At his discretion, participate in or designate someone to represent the US National Conference to parachurch and inter-denominational ministries, and to other evangelical denominations. c Encourage and promote continuing relationships with the international conferences. d. Serve as an ex-officio ministerial member of the US delegation to the General Conference. 1. The bishop shall be accountable to the Executive Leadership Team for ministry performance and moral and personal conduct. An annual evaluation will be conducted according to provisions established by the Executive Leadership Team. 2. If the bishop becomes involved in immoral or imprudent conduct or otherwise proves to be incompetent in that office, the Executive Leadership Team will request the bishop’s resignation or may remove the bishop from office by a two-thirds vote. If a vacancy occurs in the office of bishop due to death, disability, resignation, or removal, the Executive Leadership Team shall appoint an elder to serve as acting bishop until the next meeting of the US National Conference.